Modular chiller plant: in which cases are they convenient? Since 1902 when Willis Haviland Carrier invented world’s first modern air conditioning system, the air conditioning technology has grown tremendously to today, when the chiller is not only energy efficient, but also user friendly. 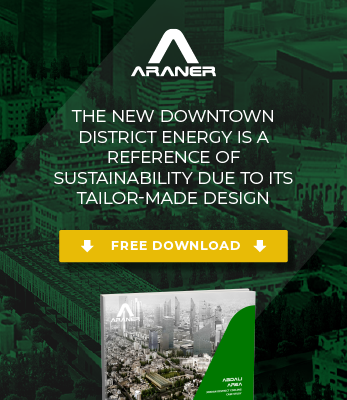 ARANER is one of the respected providers of this solution. In this post, we want to cover modular Chillers. Yes, there are obvious drawbacks of these chillers, but there are also instances when this could be a preferable technology for a District Cooling system. Below, we highlight examples of those scenarios and let you decide if you need this kind of plant. What are your chiller plant requirements? This is the first question you should ask as you search for a chiller. There are several main parameters to be considered such us: is going to be an online plant or with thermal energy storage, which is going to be the hear rejection method, etc. It is important also to choose between modular and conventional chillers. Based on our experience, we think it might be convenient for you to settle for a Modular Chiller if you face the following issues. ARANER avails the system to your site in form of modules, and commissioning happens a few moments later. This has to be the most desirable thing about our Modular Chiller Plant systems. In other words, most of the time spent during the installation – civil works, mechanical works, welding and cables testing. All piping joints, electrical signals and control signals are tested at the factory reducing the commissioning time. Installing a District Cooling Plant can be expensive, especially considering all the carrying and clearing needed before every component can be operational. Gaining access through limited spaces can also be a dangerous affair. As modular plants are coming from the factory as a standard equipment, the number of permits required is very much reduced when compared with constructing a building for a new cooling plant: permits from the authorities are minimum and the number of hot works permits is also very small when working inside power plants, petro-chemical factories or similar. Site works like pipe cutting and welding, cable pulling etc. are done in a dirty environment, not comfortable and sometimes the available tools are not the most suitable. This will reduce the final quality of the plant and increase the probability of failures during operation. In modular chillers, most of these works are performed at the factory in a controlled and clean environment, with very professional tools and even numeric control for the fabrication. The quality of the final product is excellent. Constructing a conventional Chiller Plant requires a wide range of materials and qualified manpower. Sometimes and especially when the plant is going to be installed in a remote area, some materials and enough manpower might not be available or bringing them might be too expensive. For these cases, the solution of modular chillers is perfect. In modular chillers, most of the materials are installed at the factory and the site works and required site manpower is reduced. A situation is recorded whereby a Baniyas Chiller Plant was producing 85 decibels of noise, creating untold discomfort to residents around. The company from Abu Dhabi had to ship acoustic barriers from the UK to reduce the noise. Conventional facilities can pose noise pollution. If your area has noise regulations and a conventional plant seems unable to comply, then you can try a Modular Chiller Plant. As experts in the design, delivery and installation of process cooling plants and technologies, ARANER is a preferred solutions provider by many clients across the globe. While we are capable to and do offer a range of Modular Chiller products and services, we prefer to customize facilities to achieve specific objectives. Our focus is on custom-made solutions because we believe these give the best results to our clients.